Unite Waitemata Community Branch : HOUSING IS A HUMAN RIGHT! AFFORDABLE HOMES NOW! HOUSING IS A HUMAN RIGHT! AFFORDABLE HOMES NOW! STOP SALE OF STATE HOUSES! The Housing Crisis and how it affects People. The average rent for a three-bedroom home in Auckland is $500 a week, $150 more than the national average. There are lots of families out there that cannot afford to pay market rent. The cutting back of the number and quality of state houses in New Zealand comes at a time of high unemployment, low wages and harsh austerity cuts. This is the time when the housing system needs to be strengthened, not attacked. 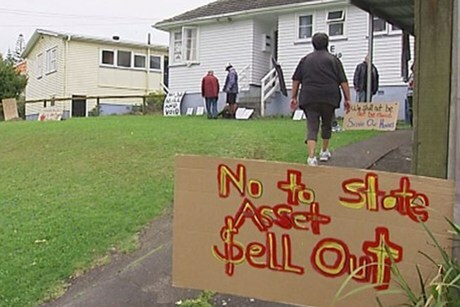 State houses are being removed and sold all over the country. There are many unoccupied state houses all over the country, which should be in use for those who really need them. Instead these houses are getting ready to be put on the market. Auckland's housing shortage is forcing people to live in caravan parks! Houses for human need, not profit! quality state houses in the next 2 years! No removal of state houses!